Property 3: Detached chalet, very well located in a very quiet set of 29 chalets. 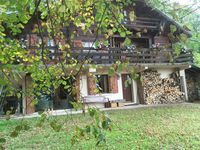 Property 18: Very nice small chalet, with a cosy interior in a very quiet area. Property 23: Detached chalet - 5 people - 800m from the hedgehog waterfalls - Free Wi-Fi - Chalet N°4 "Le Lynx"
Property 24: Detached chalet - 5 people - 800m from the hedgehog waterfalls - Free Wi-Fi - Chalet N°1 "L'éventail"
Property 28: Detached chalet - 5 people - 800m from the hedgehog waterfalls - Free Wi-Fi - Chalet N°10 "Le Moulin"
Property 30: Chalet Hérisson *** 8 people comfortable with beautiful panorama. Property 39: Detached chalet - 5 people - 800m from the hedgehog waterfalls - Free Wi-Fi - Chalet N°5 "Le Gour bleu"
Property 49: Detached chalet - 5 people - 800m from the hedgehog waterfalls - Free Wi-Fi - Chalet N°8 "La Forge"